There are many different conducted susceptibility test procedures, below is an example of bulk current injection (BCI) testing. Other specifications on bulk current injection and susceptibility testing may be quite different. 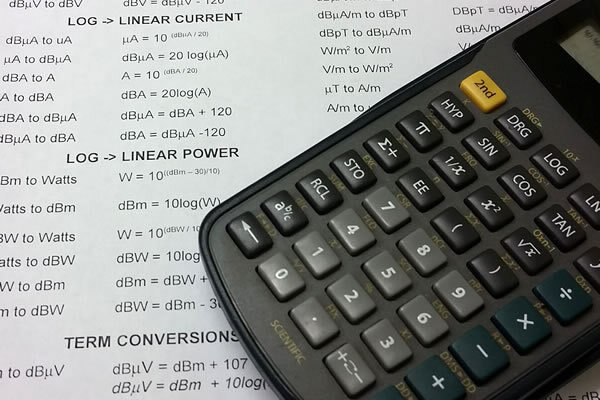 The most common test standards that utilize bulk current injection are MIL-STD 461 (Military), RTCA/DO-160 (aeronautics), IEC 61000-4-6 (commercial) and ISO 11452-4 (Automotive). BCI tests use a current probe similar to current probes used for military conducted emissions (CE) resting. A current probe acts as a single turn primary, multiple turn secondary transformer, placing low series impedance in the probed power line or signal lead while capable of driving a usable signal into a 50ohm receiver. A current probe is characterized by its transfer impedance, ZT (dBohm) the ratio of output voltage into a standard load (usually 50ohm for EMI testing) divided by the net current traveling through the probe window area. An injection current probe, with similar core materials but heavier windings, acts as a multiple turn primary and a single turn secondary transformer, when placed around a power line or signal lead. Thus it provides a (nominal) 50ohm load to the susceptibility signal source, while providing a lower susceptibility signal source impedance when placed in series with the cable under test (CUT). An injection current probe is characterized by its insertion loss (dB). The insertion loss describes the inefficiency of the clamp relative to direct injection into a 50ohm circuit. See Figures 1. Introduction: Bulk current injection testing is to confirm that RF signals, when coupled onto interconnecting cables and/or power supply lines, will not cause degradation of performance or deviation from specifications of the equipment under test. In addition, it will provide an amplitude/frequency malfunction signature. Due to the occurrence of large variable circuit impedance's and resonances in cables, a calibration fixture is used to establish the forward power into the injection probe, which develops defined currents in the calibration fixture. The actual injected current is monitored by a monitoring current probe. The limits of current are established in a "Precalibration Test Set Up". This test configuration is shown in Figure 1. Equipment: In order to carry out a Bulk Current Injection Test, the following equipment may be required. Precalibration: This test procedure consists of precalibration to establish the levels of forward power necessary to generate the specification limits while clamped onto the calibration fixture. The signal source (signal generator and amplifier) delivers power to the clamp through a directional coupler. The clamp drives a current through the 100 ohm circuit comprised of a 50 ohm termination on one end of the fixture, and a 50 ohm attenuator and spectrum analyzer/receiver on the other end. 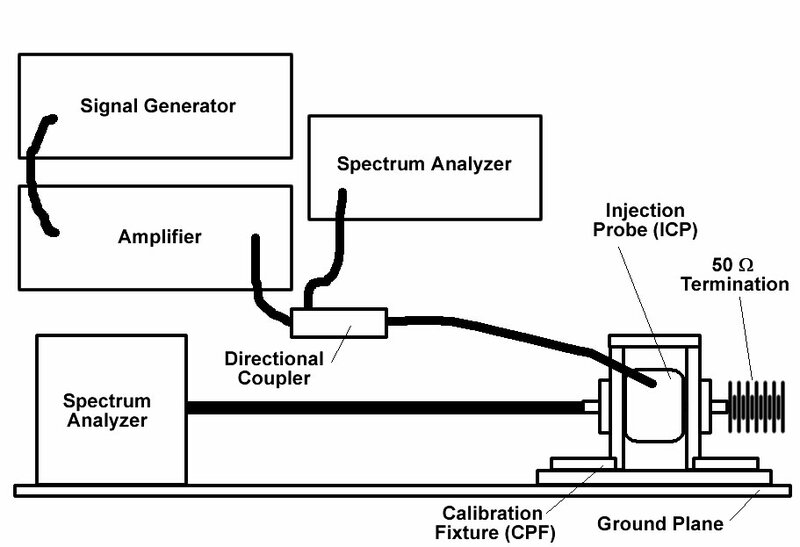 The injection probe will be clamped in the calibration fixture as shown in Figure 1. The calibration fixture will be terminated in a 50 ohm, 50 watt RF load at one end and a 50 ohm receiver 30 dB attenuator will be required to protect the receiver or spectrum analyzer. The VSWR of the terminations at both ends of the calibration fixture will be less than 1.2:1 over the frequency range of the test. An accept/reject level of current which should not cause a malfunction in the equipment under test. A level of current which will cause a malfunction in the equipment under test, without creating permanent damage to it, or the specification level. Increase the test signal to the injection probe until the accept/reject level of current is flowing in the calibration fixture. Record the forward power and reverse power necessary to generate the accept/reject level of current. Increase the test signal until the specification levels of current are achieved. Record the forward power and reverse power necessary to generate the specification levels of current. Repeat steps 1-4 over the required frequency range. The calibration frequency range can extend from 10 kHz to 400 MHz. The forward power in steps 1-4 identifies the total power from the amplifier required to achieve the necessary current levels. The reverse power permits the ability to 1) establish the VSWR of injection probe, 2) the power forward - power reverse establishes the net power delivered to the load attached to the calibration fixture. The test report shall document steps 1-4 data. Caution high RF voltages and currents are being generated during these tests. Personnel conducting tests should not come in contact with any exposed metallic items of the test setup. Carry out the Precalibration Procedure Steps again in this test configuration and record the current from the broadband current probe. Repeat this test for all frequencies necessary. Measure enough frequencies to be sure that all susceptibility levels have been determined. At frequencies where the equipment under test shows susceptibility, reduce the signal levels until the susceptibility stops. Record the same data as in step 2. SAFETY: The equipment test shall be applied to individual wires and entire cables as required by the specifications. A test procedure will be prepared that identifies each wire and cable to be tested. 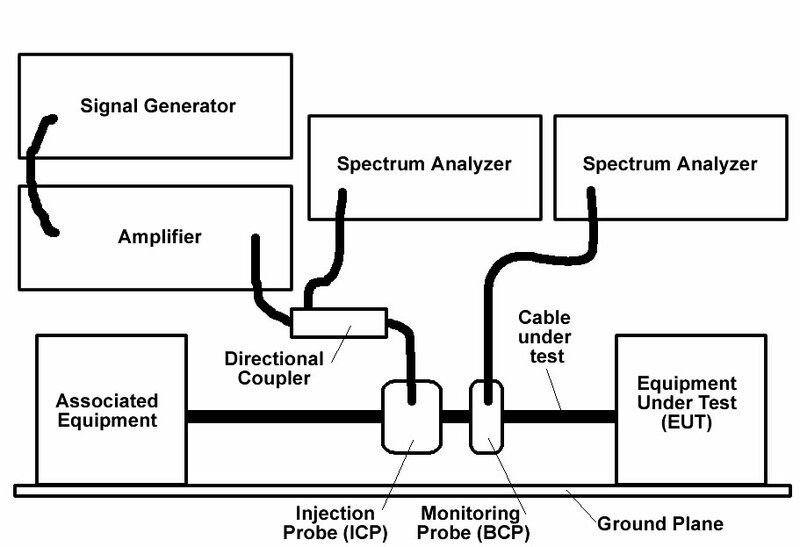 In all cases of injected current, the test configuration used shall be as shown in Figure 2. The broadband current probe shall be placed at the specified distance from the injection probe. This distance is approximately 5 cm for most specifications. Use extreme care when clamping current probes around uninsulated conductors. It is advised to de-energize the test item during assembly and dis-assembly of the test setup. Place all conductors passing through the aperture of probes in the center of the aperture for additional voltage breakdown protection. Do not permit the uninsulated current probe connector and cable connectors to come in contact with the ground plane or other adjacent conductors.